20th Century Fox's long-gestating Clue remake is finally moving forward, with the studio bringing on Ryan Reynolds to produce and develop the adaptation, which is being crafted as a star vehicle for the actor/producer. The studio is also in talks with Deadpool and Deadpool 2 writers Rhett Reese and Paul Wernick to write the screenplay. No director is attached at this time, but this marks the first time in well over a year that this project has had some movement. And it will be the first movie in a huge new deal that Ryan Reynolds just signed with Fox, which should carry him over to the mouse house in the impending Disney era. The actor has signed a three-year first look deal with the studio to develop new projects through his Maximum Effort production company, and this Clue project will be the first movie under this deal. This is considered a huge get for Fox chairman/CEO Stacey Snider and vice chairman Emma Watts. Deadpool is the highest grossing Fox film since Avatar came out several years ago. And the $783 million worldwide gross makes it the grossing R-rated film of all time. This project was originally in development at Universal for a number of years, with Gore Verbinski slated to direct at one point, from a script by Burk Sharpless and Matt Sazama, but Universal dropped the project back in 2011. Then in 2016, the remake moved to 20th Century Fox, with the studio teaming with Hasbro's new film production arm, Allspark Pictures. Our report from August 2016 revealed that 20th Century Fox, much like Universal, wanted to make this board game adaptation a "worldwide mystery," with action-adventure elements that would hopefully spawn a new franchise for the studio. With these new writers coming aboard, it remains unclear if the studio's approach remains the same or not. The original board game spawned a Clue feature film adaptation in 1985, which starred Tim Curry as the butler Wadsworth, Eileen Brennan as Mrs. Peacock, Madeline Kahn as Mrs. White, Christopher Lloyd as Professor Plum, Michael McKean as Mr. Green, Martin Mull as Colonel Mustard and Lesley Ann Warren as Miss Scarlett. All of these characters are invited to a Victorian mansion in New England for a dinner party, where they learn that they're all being blackmailed by Mr. Boddy (Lee Ving). While the film wasn't a huge hit at the box office, grossing just $14.6 million, it developed a cult following upon its release on home video platforms. 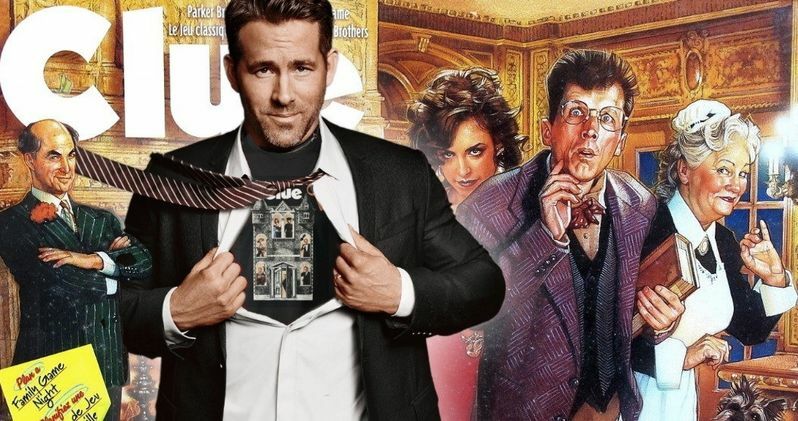 What remains unclear at this point is if Ryan Reynolds and writers Rhett Reese and Paul Wernick plan on keeping the now-infamous triple-ending intact. Director Jonathan Lynn shot three separate endings, and during its theatrical release, and theaters all across the country received only one of the three endings at random. The home video release showed all three endings, with the final ending said to be, "what really happened." There was also a fourth ending that was filmed, although the director had it removed and it never saw the light of day. This marks the fourth collaboration between Ryan Reynolds and writers Rhett Reese and Paul Wernick, following Deadpool, last year's sci-fi drama Life and this summer's Deadpool 2. The writers are also working on a long-gestating sequel to their 2009 hit Zombieland, with Ryan Reynolds coming off Life and the modest hit The Hitman's Bodyguard last year. He has also signed on to voice the title character in Legendary's Detective Pikachu, and he is slated to return as Deadpool in the upcoming X-Force movie. Deadline broke the news of this project earlier today.